NEWTON, MA, June 12, 2012 – Working just as hard in the classroom as you do on the field, court, track or in the pool is a recipe for success, according to the all-star roster of speakers at this year’s 2nd Annual Dream Big! Leadership Conference. Presented last week by Dream Big! 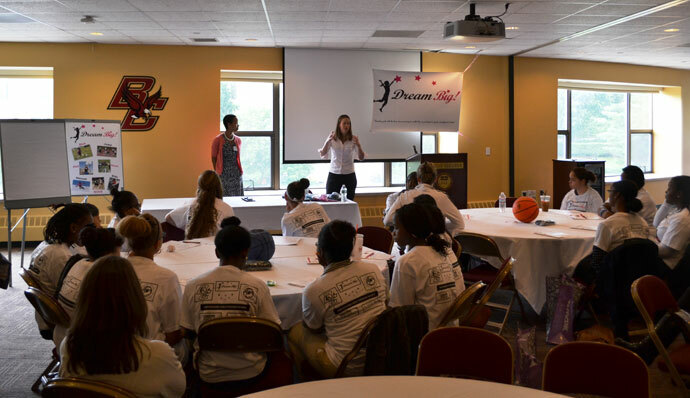 and hosted at Conte Forum by Boston College Department of Athletics, more than 135 girls from a dozen schools in Greater Boston and Lawrence joined 20 of their teachers and coaches to hear directly from former Olympic, professional, collegiate and high school female athletes about how sports – and the friends and mentors they met through sports – paved the way for tremendous personal and professional success later in life. Emphasizing the equally crucial off-the-field benefits, the Dream Big! 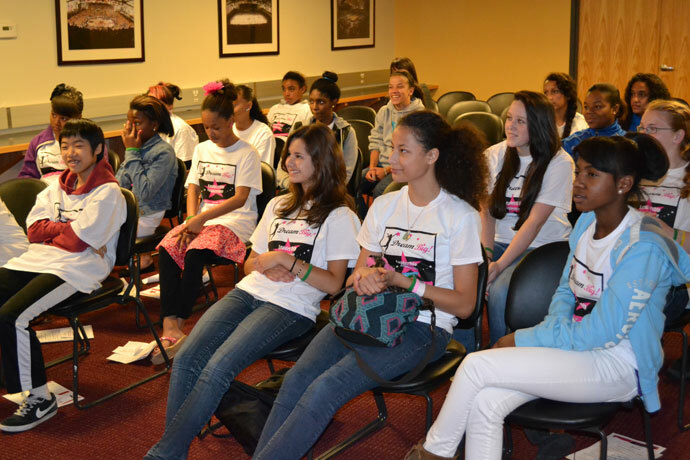 Leadership Conference provided opportunities for middle school and high school girls to meet and interact with accomplished women on a college campus while learning about the wide range of educational and career opportunities available to them in today’s society. Girls heard first-hand the stories of women who participated in sports, faced many of life’s challenges and came out on top thanks to the lessons they learned through their athletic endeavors. Importantly, the presenters emphasized the critical role that working hard in school, making healthy lifestyle choices and believing that you can accomplish anything plays in enabling the students’ own dreams to come true. Students and teachers/program leaders attending the conference represented Beantown Jumpers; Beyond Soccer; Codman Academy; Boston Centers for Youth & Families - G.I.R.L.S. Initiative; Doc Wayne Athletic League; Edison K-8; Germain Lawrence; Higginson-Lewis K-8; John D. O’Bryant School of Mathematics & Science; Mildred Avenue School, Quincy Catholic Academy; and Timilty Middle School. Another conference highlight was the Positive Coaching Alliance (PCA) student athlete workshop entitled, “Becoming a Triple-Impact Competitor”, presented by The Boston Foundation – CHAMPS Boston Program Associate Brianna Forde. Anyone who plays on a team is a participant. However, it requires hard work, commitment and personal growth to become what PCA calls a “Triple-Impact Competitor”. This interactive workshop defined what it means to be a Triple-Impact Competitor, in terms of how an athlete can improve: THEMSELVES (through the ELM Tree of Mastery), THEIR TEAMMATES (by Filling Emotional Tanks) and THE GAME (through Honoring the Game). Dr. Lauren Smith, Medical Director and Chief Medical Officer of the Massachusetts Department of Public Health and Dr. Megan Leo, Attending Physician at Boston Medical Center discuss medical careers and the impact sports had on their lives with Dream Big! conference attendees. John D. O'Bryant Middle School athletes with Coach Ryan at 2nd Annual Dream Big! Leadership Conference at Boston College. 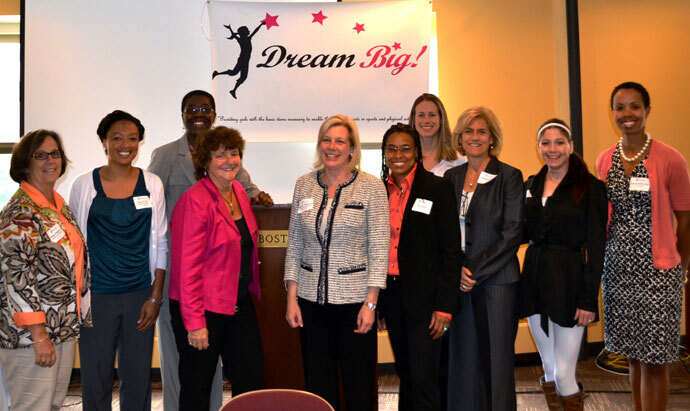 Founded in 2010, Dream Big!’s mission is to help break down the economic barrier that prevents girls from economically disadvantaged communities from participating in sports and physical activities. Led by Linda Driscoll, a non-profit and sports management professional for 25 years, she launched the Massachusetts-based 501c3 charitable organization to ensure that all girls, regardless of socio-economic background, have the equipment, uniforms, sneakers, program fees, training expenses and opportunities and supplies they need to participate in sports and physical activities that contribute to their overall health, fitness, and well-being. In just two years, Dream Big! has already had a direct, positive impact on more than 2,000 girls through equipment grants, program scholarships, sports clinics and the Dream Big! Leadership Conferences.